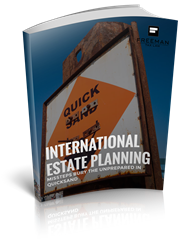 Freeman Tax Law, a tax law firm specializing in offshore tax issues and international wealth and estate planning, recently released an International Estate Planning eBook. Freeman Tax Law, a tax law firm specializing in offshore tax issues and international wealth and estate planning, recently released an International Estate Planning eBook. The eBook explores and explains some of the most common mistakes that people make in regards to their foreign assets and estate planning. The eBook is a part of a series of content created by Freeman Tax Law that teaches crucial and need-to-know information about the most common foreign tax and wealth planning issues that U.S. citizens and residents face. Freeman Tax Law is a proven international tax law firm with particular focuses in analyzing difficult wealth management problems, IRS collections issues, and foreign bank account reporting. Through careful planning, negotiation, and execution, Freeman Tax Law has an excellent record of meeting and exceeding expected outcomes for their clients, and utilizes a team-based approach to cases through a multi-disciplinary defense team.